French 19th century Still Life Painting - Oil on Canvas - unsigned - in good condition. 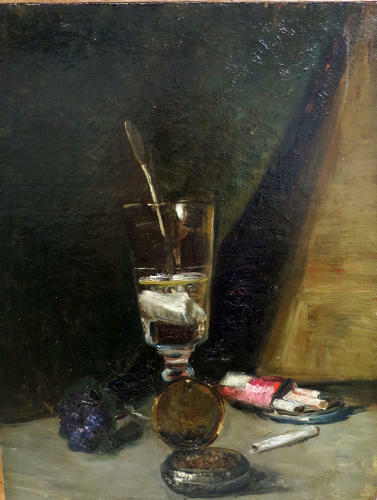 A nostalgic scene of a solitary Absinthe Glass with its special perforated 'spoon' designed to hold a lump of suger through which you drip water. This painting is very reminicent of 'La Vie Boheme' when the drink was so popular with Artists in search of the clarity of mind and inspiration that Absinthe provided. This charming little painting is so typical of the early 1900s when it was undoubtedy painted.